I have been wanting to dye my hair with henna for years. 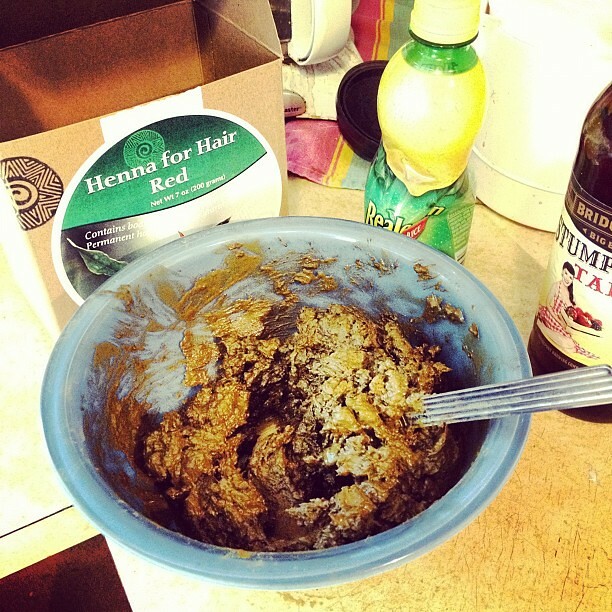 I was intrigued when Wendy of wendyknits started using henna to dye her own hair. I suppose this has been something on my unconscious “Awesome List” for several years! I am just realizing this. Something prompted me to take the plunge a couple of weeks ago (I don’t recall what that catalyst was) so I bought some from hennaforhair.com. I remembered reading that for the best results you want to use “body art quality” henna, and this place has it. It’s kind of spendy, though. And shipping is outrageous (So I would love to find a local seller of it). It came in the mail and, no time like the present, and, “don’t put off till tomorrow what you can do today” and all of that. I decided to just do it this weekend. It is quite the process. You have to mix up the henna with something acidic. I chose straight lemon juice. Mix up and let it sit overnight. 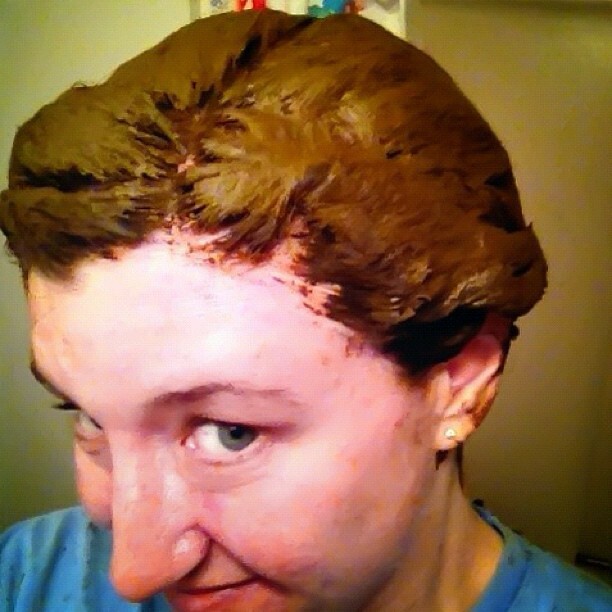 Another quirky thing about this process is that it has to sit on your hair for-fricken-ever. So I got up at 5:00am and started the process. I washed my hair, dried it, had a cup of coffee, then I started smearing the goop in my hair. It took a long time to do this. And it was really disgusting. It was the most disgusting thing I have ever done in the name of beauty. I tried to coat sections of hair and when I was done I looked like Medusa. I couldn’t take a photo of myself looking like this because my gloves were filled with green goop. 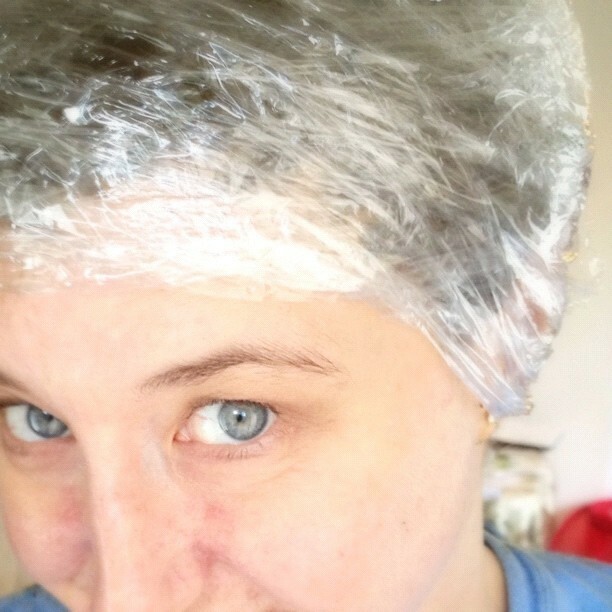 But here is a shot of my head right before I put the saran wrap on it. Yes, saran wrap. You wrap your head in saran wrap and then wait for hours and hours. I waited 3. Then I rinsed it out. This was very difficult, as well. The mixture dried on my head and my hair was matted together. It didn’t come out easily. But, eventually, it did. It is supposed to deepen in the next few days. But I actually really like it a lot! My hair actually feels pretty fantastic, too. Also, it covered up the gray hair really well. Admittedly, I don’t have very many gray hairs but they are there and I know exactly where they are and I don’t like them. Here is another snapshot of it in the sunlight. Do I like it enough to do it once a month? No. Perhaps every other month, though.